Equipment maintenance is a key consideration for successful winter wheat planting, so calibrate your drill to ensure proper seed placement and good seed-to-soil contact. Otherwise, the crop could be at risk for crown and root rot, winter injury or even winterkill. Seeding depth and rate are 2 critical components when setting up your drill and are highly dependent on type of wheat variety, soil type, planting date and moisture conditions. Be sure to consult with your university extension and drill manufacturer for guidance specific to your farm and equipment. In the meantime, there are some over-arching principles to keep in mind before heading to the field. As moisture decreases, decrease seeding rates. Having fewer plants in areas with lower precipitation allows plants to more efficiently use available moisture rather than competing with more plants for this limited resource. When planting is delayed, increase seeding rates. This is to help off-set the reduced number of tillers a plant has time to produce before dormancy. As coleoptile length increases, increase the seeding depth. If seeded too shallow, varieties with long coleoptiles can experience reduced secondary root development and risk the crown being exposed. Varieties with short coleoptiles that are planted too deep can experience reduced emergence. In sandy, coarse soils, increase the seeding depth. For clay, fine-textured soils, decrease seeding depth. For accurate seed depth recommendations for your farm, connect with your extension agent or AgriPro® Associate. Ensuring that your equipment is properly calibrated helps with successful seed-to-soil contact. There are several ways to calibrate seed drills; we’ll cover the 4-step stationary method. Determine your target seeding density based on the average precipitation. This target can vary by state so consult with your AgriPro® Associate or extension agent. Determine the number and weight of seeds per 50 drill-row feet based on row spacing and target seeds per acre. Calculate how many times to rotate the drive wheel to account for 50 drill-row feet. Use your manufacturer’s seeding rate chart to set your seed meter. Then test with a simulated drill operation. 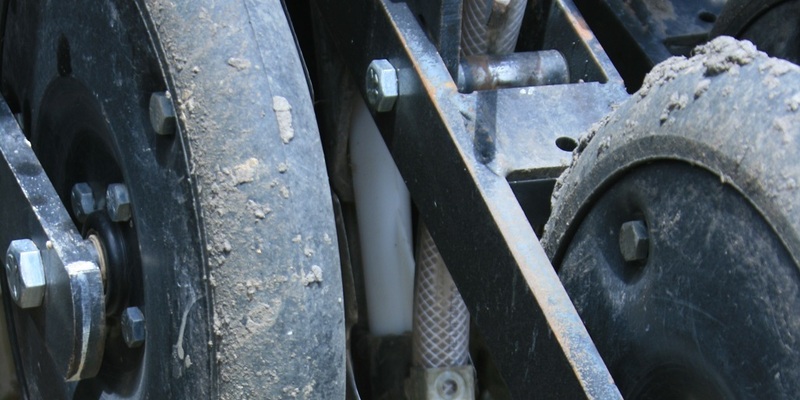 In addition to any calibration adjustments you may need to make to hit your target seeding rate, you may need to adjust the seed opener, depth wheels and closing system to ensure proper seeding depth and seed-to-soil contact. Check out our 4 other tips for success this winter wheat planting season.